As a non-dog owner I’d struggle to tell the difference between a spaniel and a terrier, quite frankly. However, I can give some useful advice on dog friendly holidays, beaches, ferries and accommodation on the Isle of Wight. As a general summary, you'll find there are plenty of places to stay and eat which welcome dogs (and the Isle of Wight ferries are dog friendly), but you're a bit limited when it comes to dog walking on Isle of Wight beaches during the busy summer months. Holiday Parks: For cheap, dog friendly accommodation many people go for one of the Isle of Wight’s caravan holiday parks. All of the Isle of Wight’s Park Resorts/ Parkdean Resorts holiday parks are dog friendly (Nodes Point in St Helen's, Thorness Bay in Cowes, Landguard in Shanklin or Lower Hyde, also in Shanklin) as are The Lakes, Rookley (formerly Rookley Country Park), St Helen's Coastal Resort, The Orchards Holiday Park, Appuldurcombe Gardens Holiday Park and Colwell Bay Holiday Cottages. You can compare the caravan parks and other dog friendly ones in our holiday park guide. Hotels: If you would rather stay in a dog friendly hotel, I managed to find a choice of about 15 with Expedia. Some charged a bit extra to bring a pet (not sure if your dog gets a bed...). Some of the Isle of Wight's highest rated dog friendly hotels and B&Bs include Heatherleigh B&B or Luccombe Hall Country House Hotel in Shanklin, Mulberry Cottage B&B in Bembridge or Villa Rothsay Hotel in Cowes. ​Search Expedia for dog-friendly Isle of Wight hotels. Are the Isle of Wight's beaches dog friendly? Well, yes and no. During the summer months (May to September) lots of the Isle of Wight's most popular beaches have a ban on dogs and you can expect to endure some pretty serious stares and tuts if you're the one person ignoring the signs (and they might fine you £75 as well). However, several beaches either allow dogs completely in summer or just in certain sections. Colwell Bay (only the section right of the slipway) - pretty beach with only a small amount of sand but nice views towards Hurst Castle, toilets and pay and display parking. Yaverland (only the section to the left of the car park as you look out to sea) - plenty of sand, a bit windy (just like me after sprouts), pay and display parking, toilets and ice cream shop. Steephill Cove - secluded Cornish fishing village style cove in the South Wight with thatched cottages and a fairly small beach. Nice walk through to Ventnor. Check our lovely clickable beaches map for more information. Here's a link to the official Isle of Wight council map. 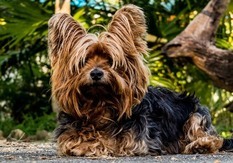 ​Also, bear in mind that you can always walk your dog on a lead along the esplanades at Shanklin, Sandown, Ventnor, Appley, Cowes and other resorts. It is just the beaches which have dog exclusion zones. Wightlink (which runs ferries from Lymington and Portsmouth) prefer dogs to stay in cars during the crossing, so you’ll be apart for about 40 minutes. However, if your dog can’t cope with that there is a designated dog section on the ferry and there’s a request on the Wightlink website that dogs are ‘relieved’ first and stay off the seats. Red Funnel (which runs ferries from Southampton) says you can keep dogs in cars with the option of a pet area if you’d rather not leave them alone for the hour long crossing. There’s a £50 fine if your dog poops on the ferry. Pets can also go on the Red Jet foot passenger ferry. Hovertravel also allows dogs on leads, and they also have a fine if they relieve themselves during the 10 minute crossing. There's more detail in our beginners' guide to Isle of Wight ferries. The Isle of Wight has more than 500 pubs, cafes, restaurants and bars but thankfully there is also plenty of outdoor space to avoid the whole Island looking like fat camp. ​It seems a bit unfair to pick out only a few dog friendly eating places when there are dozens, but here are a few that we like to get you started. 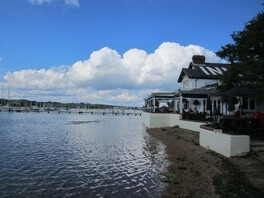 The Folly Inn in Whippingham, near East Cowes is a large riverside pub with reasonably priced pub grub. It gets a little raucous - there are little dents in some of the tables because they have dancing on the tables on certain nights. I would imagine dogs are not allowed to dance on the tables, but I’ve never actually asked. The Bargeman’s Rest in Newport is similar to the Folly, in that it’s alongside a river and offers pub grub. It also has live music fairly regularly, which is ideal for dogs with a strong sense of rhythm. Culver Haven is in a dramatic location at the top of Culver Down with views out to sea. I'd suggest you reserve a seat with a view. The Crab and Lobster is a decent but not especially posh pub in the posh village of Bembridge. The Spyglass Inn in Ventnor is a big pub in a top-notch location overlooking crashing waves. It offers fairly standard pub grub (loads of chips etc). Fisherman’s Cottage in Shanklin is an historic thatched pub right on the beach at the bottom of Shanklin Chine. Good fish and chips. The Steamer Inn in Shanklin is a nice esplanade bar with sea views. The best directory of Isle of Wight Vets that I've found is on the RCVS website. NutsAboutDogs.uk is a team of dog lovers on a mission to establish the first European type public dog school on the Isle of Wight. They offer things like agility courses and quick refresh-classes of basic obedience for visitors.